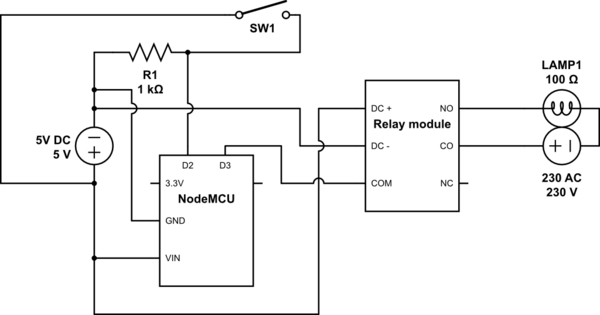 i am new to these circuit things, i am using Node MCU (ESP8266) board with relay board. To connect to a bulb, but i want to keep my old (one way) switch as it is. Also i want to add internet switching to this button. How my circuit should look like? Two way switch will be compulsory to use here? What my circuit should look like? with two way switch and one way switch. First of all, a light bulb works on regular 110 or 230V AC depending on where you live, so directly connecting a wire to, for example, see if the hardware switch is turned on, would fry the NodeMCU. You'll need a relay break-out board that can handle these outputs on the COM/NO/NC (which most of them do) but they usually operate on 5V DC. A NodeMCU can thus only supply the trigger signal to the relay, you'll need for example a AC to 5V DC power supply (like an iPhone adapter) to power your circuit. The circuit will contain of the relay board (connected with its DC in and out to the adapter and the com port to one of the GPIO's from the NodeMCU) and the NodeMCU itself as the 'brain' of the operation. I don't exactly know what you mean by 'two-way switch' but the way I'd handle the situation is to wire the switch to the NodeMCU. This means the switch is connected to the 5V power adapter and when the switch is on, the nodeMCU will know because there will be a positive value at one of the GPIO's (whichever you choose). You can then also handle both commands from a server and the switch itself. EDIT Here is the schematic you asked for. not the prettiest thing but it should make things clear. Let me know if you have any more questions! How does ESP8266 work as web server with Arduino? Which board should I use with ESP8266 Lolin V3 in Arduino IDE?